I have been saying for some time, that our Military, Police, FBI and CIA are being steeped in fear and suspicion of Islam and Muslims. This takes forms of “Recommended Reading” Lists provided to them during and after their training…and on the lists are books such as “The Politically Incorrect Guide to Islam” by Robert Spencer, books by “experts” on Islam and terrorism, like Daniel Pipes and a host of other bigots who make a lot of money spreading their venom against Islam and Muslims. Additionally, “experts” are hired by the military, the FBI, the CIA and often, paid for, by Department of Homeland Security (I call it “Fatherland Security”) funds. These “experts” got to their fame and fortune by spreading fear and hate against Islam and Muslims, by “quoting” enough out-of-context snippets from the Quran to make their case before naïve audiences who do not seek to verify the “quotes”…if they did, they would know them to be false! These days, it is enough to speak loud and long about how Muslims are predisposed to violence and how they are easily recruited as suicide bombers…and then move on to talking about Muslims, Muslims and MUSLIMS, so that by the time these “experts” are done, another cadre of fully-armed guardians of the nation, is ready and willing to nab the last “Muzlem“! Sure, there is that pesky thing called the constitution, but it is an old document that really does not match up to the new realities and some flexibility has to be built into the system in order to keep us all SAFE. Which is why we still have (http://www.guampdn.com/article/20110901/NEWS01/109010349/Man-held-since-9-11-illegal-entry?odyssey=tab|topnews|text|Frontpage) “detainees”, held without charges, since 9-11-2001…yes, its been ten years, but they are kept in humane conditions. Which is why we continue with out “robust interrogations” abroad. Which is why our President signed an order to assassinate a US citizen without even a trial. Let’s not get bogged down by legal matters, when we are trying to keep our nation safe…if you are a REAL patriot, you will be more concerned about AMERICA than about them Muzlems! 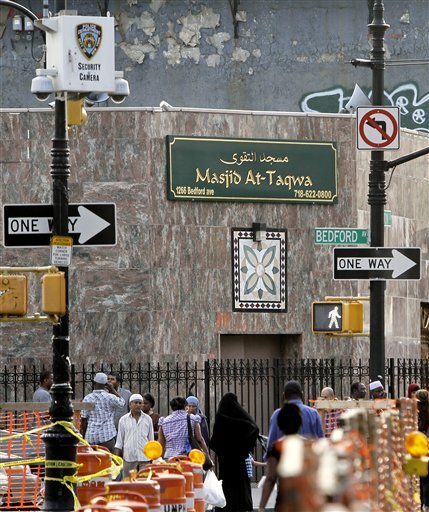 Just two days ago, Associated Press broke the news that the CIA was working with the New York Police Department (http://abcnews.go.com/US/wireStory?id=14417797), profiling and conducting surveillance on Muslims or, people with “ancestries of interest”. No, this was not a genealogical society with in interest in Muslim history. These NYPD officers in their ‘Demographic Unit’ drew demographic maps of Muslim populations in New York (remember, this was also tried by LAPD? http://articles.latimes.com/2007/nov/10/local/me-lapd10) and then, infiltrators were sent among those populations, to find out who was angry at the US (okay, I am…sue me!) and who “supported terrorism”. Oh say, can you see, the cameras that be...? The REALLY bad thing is the fact that the CIA is involved in internal operations…again! the CIA is specifically required to act ONLY outside the US or, they are breaking the law. Again, the weasel crack is that they are not acting against REAL Americans, they are acting against “Muzlems” and that might make it okay…at least, nobody in the House or the Senate will dare question this matter for fear of looking wimpy on “trrrrsm“. Police departments all over the country, are following the rut of anti-Muslim training, in part because it is free (Fatherland Security pays for it), in part because it helps them get free clock hours and in part, because it gets them extra credit for being trained against “terrorism”. The fact that Muslims are on the screwed end of this deal, does not bother anyone at all. NYPD, LAPD…the Pennsylvania Police Training Commission even produced an entire manual devoted to the violent and destructive nature of the Quran, Islam and Muslims. Let us talk about our own Seattle Police Department. Why are these men and women being sent for training to places where it is CERTAIN that they will be brainwashed into fearing and suspecting Muslims? The 9th Annual ICTOA Conference is being held on Oct 17, 2011 in Las Vegas Nevada. For those who don’t know, ICTOA stands for, “International Counter-Terrorism Officers Association“. Of course, REAL Americans have no problems with this, they see the word “trrrrsm” and they whip out the flag and scream, “Let’s roll!”. REAL Americans will be pleased to note that Daewon Kim & Britton Schaefer from the Los Angeles County District Attorney’s Office, are teaching a couple of workshops and will also be speaking during lunch, to make sure your appetite is kept sharp. Their specialty appears to be “JI-had“. I contacted the ICTOA people and asked about the contents of their lectures and about their knowledge of Islam and got a terse response that ICTOA is a private organization and therefore, not subject to Freedom of Information Act requirements. Another “expert” is William Gawthorp. This man got training in intelligence and in warfare, but probably decided that taking a stand against Islam and Muslims is a better career path; he is teaching workshop/s on, “Strategic Themes & Drivers in Islamic Law“. Can anyone have doubts that people attending this excuse for “counter-terrorism” Conference will return with a trigger-finger itching to get some “Muzlems“? The titles of these “workshops” alone, are enough to convince anyone who actually knows more than the basics about Jihad or, Islamic law, that these “experts” are bogus. The Seattle Police Department should not be sending their officers to such conferences as long as bias-producing “experts” are invited to speak at such conferences…no self-respecting Police department should be! SPD has been sending their officers to ICTOA conferences in the past, but they need to put a stop to this practice otherwise, there will be no incentive for organizations like ICTOA to stop inviting anti-Muslim “experts”. The big question is, How do we get them to listen? What more do you know about Britton and Daewon? Did you see their material? I know nothing about Britton or Daewon’s materials. However, when some “expert” decides to speak about “Ji-had”, I can already tell you, it is going to be irrational, emotionally charged and almost entirely baseless information. I tried to contact these two officers in order to find out more about their presentations, but I received no acknowledgement from them. I’ll bet $100 that their presentations are uninformed, even at a basic level, designed to brainwash an audience and not “expert” enough to inform. An academic bet I am sure, because, since they will not share their “teaching” materials, we’ll never know. Some of the best books on Islam are by an ex-nun, Karen Armstrong and a Rabbi, Reuven Firestone…I highly recommend them to anyone. It is not the faith of the person that makes for a good, informative read about a religion, it is the knowledge and compassion with which the subject matter is presented. For instance, one would not go to a Nazi for information about Judaism and Jews, nor would one go to the KKK for information about Blacks; why go to people who distrust or, hate Islam, for information about Islam? Muslims ARE making a little headway finally. We have the attention of some members of the Senate who are asking difficult questions and the military and the FBI are starting to react by reducing the bigots on their list of “experts”. Keep complaining. If enough people start to complain to the top-level people, we will finally succeed in stopping other biased programs, inshaAllah! I feel foolish by asking this-should I address you as Jeff or by your proper Islamic name? I know some people who know some guys…. would you ever want to openly talk to those guys…. Sorry I had to throw some American gangster/mob talk in that. I’m still trying to be American. You may address me as Jafar or, Jeff, it doesn’t matter. As far as “Islamic Name” is concerned, I would suggest EVERY name is Islamic. Put another way, no name is “Un-Islamic”. I am not sure if you mean to have me talk to someone, but if you do, I am certainly up for it. When you reply, please include your e-mail address, I will contact you directly and delete your reply so your address does not show up in the blog.